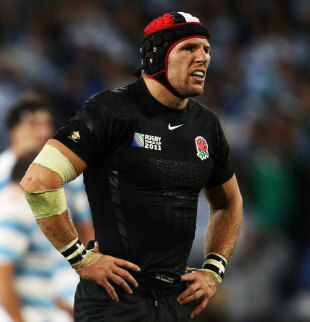 James Haskell has warned England not to dismiss the possibility of a France backlash in Saturday's Rugby World Cup quarter-final. Les Bleus stumbled into the knockout stages on the back of a shock defeat to Tonga, which prompted coach Marc Lievremont to admit his squad were not as talented as he thought. But Haskell, a former Stade Francais No.8, said: "I would never say that France look weak. "They are always very passionate, always very tough, and everyone raises their game to try to beat the English, as we saw again against Scotland. Their last two results don't matter - we've got to respect them, and make sure we concentrate on being at our best, believing they will be on top of their game too. "I'd be surprised if they didn't come at us hard, and offer a big challenge. If you look at their team they're all outstanding individuals. I've played against all of them in France's Top 14 and on their day they can still beat anyone." In contrast to France, who lost to New Zealand and Tonga, England progressed into the last eight without dropping a match, despite some off-the-field distractions. England manager Martin Johnson has had to handle a number of disciplinary challenges, with Haskell at the centre of the latest allegations. Haskell was not at his best in Saturday's 16-12 victory over Scotland but he been one of England's biggest success stories so far this tournament. England have beaten France in the last two World Cup semi-finals and earlier this year en route to winning their first Six Nations title. "When you go into the World Cup, past games are not very important. All we have to do is be prepared and play it like it's never been played before," said Haskell. "Discipline is something that we need to work on."